December 25, 2018 /17 Comments/in Featured Articles, White Racial Consciousness and Advocacy /by F. Roger Devlin, Ph.D.
Editor’s note: Christmas is a special time of year, and over the years TOO has posted some classic articles that bear on the season. This article by F. Roger Devlin was originally posted in December, 2013. It is an important reminder of the disastrous intra-racial wars of the twentieth century—wars that may yet deal a death blow to our people and culture given the processes that they set in motion. However, there were important differences between Germany’s Western and Eastern rivals: France and Britain were modern, compact, efficiently-organized countries capable of rapid mobilization, while sprawling Russia with its thinly spread population and economic backwardness was expected to require up to 110 days for full mobilization. Taking advantage of this asymmetry, the German High Command developed the Schlieffen plan: upon the outbreak of hostilities, close to ninety percent of Germany’s effective troops would launch a lightning attack in the West; this campaign was to be completed within forty days, while lumbering Russia was still mobilizing. With the Western powers out of the way, massive troop transfers to the Eastern front were expected to arrive in time for Germany to face down Russia. Speed—of mobilization, of offensive operations, and of troop transfer—was critical to the success of this plan. The assassination of the Austro-Hungarian Arch-Duke by a Serb nationalist in June, 1914, is the perfect example of an event which occasioned events which followed, but did not cause them; the men of Europe’s great powers did not slaughter one another for four years over a political assassination in the Balkans. Rather, the assassination occurred in the context of Russian guarantees to Serbia and German guarantees to Austria, which inevitably brought the Triple Entente into play. A diplomatic game of ‘chicken’ ensued, in which no side was willing to be the first to back down. When Austria declared war on Serbia on July 28th, the Russian Tsar, conscious of his Empire’s military backwardness, ordered a partial mobilization. This action was intended merely as a precaution in case of a war that still seemed unlikely. But for the Germans, with their Schlieffen plan requiring utmost speed, the Tsar’s order had the effect of an electric shock. Germany felt it had to mobilize as well. Russia responded two days later by ordering full mobilization. Germany gave Russia an ultimatum; and the Tsar, unwilling to knuckle under, allowed the deadline to pass. Within hours, everyone was involved in a war that none of the parties had originally wanted or intended. German historians call such a series of events a Betriebsunfall: a quasi-mechanical accident such as might occur in the machinery of a factory. Men were drawn into the gear work and crushed when no one was able to throw the emergency switch in time. It was a tragedy in the fullest sense of the word—a disaster brought on by well-intentioned but flawed men acting rationally under conditions of imperfect knowledge. The consequences are well-known: ten million dead, twenty-eight million more wounded or missing, Communism established in Russia, the Balfour Declaration setting the stage for today’s ongoing Middle East conflict, and the whole crowned by a shameful ‘peace’ treaty that all but guaranteed a future war of German revenge. Yet, as we can see from newsreel footage of August 1st, the popular reaction to the outbreak was war fever on a scale not seen since the crusades. Europe had been enjoying forty-three years of peace and unprecedented material prosperity, and the young greeted the war as a romantic adventure. The planned rapid German advance through the Low Countries into Northeast France was unexpectedly halted in early September—the “Miracle of the Marne”—foiling the Schlieffen plan. On the 13th, the German Army responded by attempting a flanking action around the French lines; the French then rapidly extended their own defensive lines in what became known as the “race to the sea.” Since neither side could dislodge the other, and neither was willing to retreat, soldiers began digging themselves in to their positions—the beginning of trench warfare. By the time winter set in, the pattern of the next four years had been clearly established: a war of attrition involving trivial advances and retreats across a few acres of mud. The Germans began by placing candles on their trenches and on Christmas trees, then continued the celebration by singing Christmas carols. The British responded by singing carols of their own. The two sides continued by shouting Christmas greetings to each other. Soon thereafter, there were excursions across No Man’s Land, where small gifts were exchanged, such as food, tobacco and alcohol, and souvenirs such as buttons and hats. The artillery in the region fell silent. The truce also allowed a breathing spell where recently killed soldiers could be brought back behind their lines by burial parties. Joint [religious] services were held. The ceasefire spread to other sectors of the front, with as many as 100,000 men eventually participating. In some areas, soccer games between the belligerents replaced combat. By December 26th, it was over. The authorities got word of the breakdown in discipline and intervened vigorously. 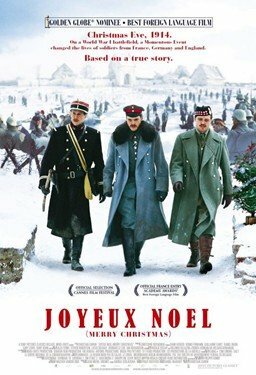 In 2005, an international consortium from France, Germany, the United Kingdom, Belgium, and Romania produced a film about the Christmas Truce: Joyeux Noёl. The film opens with scenes of children in French, British and German grade schools reciting rhymed curses they had been taught against the opposing side: the British child’s curse calls for the complete extermination of Germans. The scene switches to Scotland, where an enthusiastic young man, William, rushes into his local Catholic church breathlessly to announce to his younger brother Jonathan that war has been declared; they are to begin basic training in two days. “At last, something’s happening in our lives,” he rejoices. The priest, Fr. Palmer, looks notably less enthusiastic. At the Berlin Opera, a performance is interrupted by an officer walking on stage to announce that war has been declared. The lead tenor, Sprink, is quickly called up. In a French trench, Lieutenant Audebert wistfully looks at a photograph of his pregnant wife moments before being called to lead an assault on the German lines. In the ensuing action, Scottish William is mortally wounded; his brother Jonathan is forced to leave him behind, a psychological trauma from which he never recovers. Audebert’s men pour into a German trench, but as they turn a corner, some one-third of them are mown down by a German machine gun. The German soldiers begin setting up Christmas trees along their trenches, to the bewildered suspicion of the French soldiery. After the singers conclude their first number, a cheer goes up from the Scottish trenches. Fr. 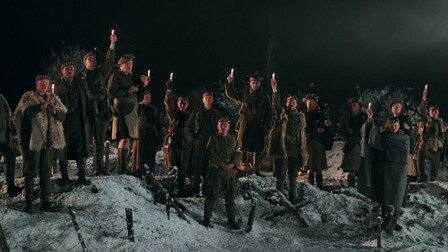 Palmer plays the first few bars of another Christmas song on the bagpipes, and Sprink responds by performing the song, climbing out into No Man’s Land. Lieutenant Audebert motions to his men to hold fire. Soon, men are pouring out of the trenches on both sides, sharing food and drinks. Fr. Palmer holds a Christmas Eve Mass for all the men. On Christmas morning, the officers renew the truce and arrange for exchanging their dead. Dozens of men are buried between the lines. A soccer match ensues. The officers realize the situation is untenable and attempt to restore discipline, but by this time the men are refusing to fire upon each other. A bundle of soldiers’ letters is intercepted by the French authorities, alerting them to the situation. Fearful of having their war spoiled, they dissolve the division and repost its members to various unaffected sectors of the front. The Germans are transferred to the Eastern front to face the Russians. Fr. Palmer is replaced by a Bishop who preaches a sermon urging new recruits to exterminate German men, women and children. A major theme of the film is music. Sprink’s superior officer begins by telling him that, being a singer, he is useless as a soldier. Then it is the incongruous presence of music that leads to the unplanned ceasefire. At the end, as the Crown Prince of Prussia informs his men of their punishment, he catches sight of a harmonica. He snatches it away and crushes it beneath his boot heel. It [was] the last expression of that 19th-century world of manners and morals, where the opponent was a gentleman. The ones who survived, who lived to see other Christmases in the war, themselves expressed amazement that this had occurred. The emotions had changed to such a degree that the sort of humanity seen in Christmas 1914 seemed inconceivable. Joyeux Noёl lost money at the box office, and critics have complained of its “sentimentality.” I suggest seeing it for oneself this Christmas season. Merry Christmas to TOO contributors, all! While not strictly a “peace” movie, I recommend “Le silence de la mer” (2004) for its subtle, humanizing touch and restraint, unusual for a WWII-set drama. It’s a remake of the Melville classic. I do not know when WW1 was decided upon but according to Trotsky’s family, planning began in 1904.It was planned to start the war in 1914 and end it in 1920. In 1919 Mr Elsworthy, a top State Dept official, said WW2 would start in 1940. In 1915 the Indian Princes offered 10 million men. The offer was refused by the British govt. Until the Balfour declaration the USA supplied the Central Powers.Yankee ships unloaded in Scandanavia,Denmark Holland and Belgium which alone received 1 million tons of meat in 1915. Diixe ships unloaded in Spain, supplies then passing through the Spanish Islands and Neutral Italy for a time. the article mentions that it was the Franco-Russian alliance of 1894, which became the Triple Entente when Britain joined in 1907, realized Germany’s worst fears, the greater more important alliance was in 1897, agreement between England, France and the USA was disclosed by an over honest USA insider Prof Usher of Washington University, St. Louis, Mo. in his book 1913, the Problem of Japan. The secret treaty (called the Entente Cordiale” was penned in the year of the Zionist, 1897), “said that should Germany or Austria, or both of them, begin a war for sale of Pan-Germanian. The USA would at once declare in favor of England and France and support [France and England Zionist corruptions ] with all of resources available to the USA. The Entente Cordiale treaty contained a reciprocal obligation ” my reference p. 69-72 MyMemoirs, 1878-1918, Ex Kaiser William II, Published by Cassell and Company, LTD, London, NY, Toronto and Melbourne, 1922. KW, II was a grandson of the British Queen Victoria of England. The Book referred to by KW, II was that of Prof Usher of Washington, U,. St. Louis, titled, 1913, the Problem of Japan.. it laid out the secret treaty in full but its content or the existence of that secret treaty was not known to KW, II. Do not forget the first Zionist Congress in 1896 Basil Switzerland, whick included all of these parties against Germany.. was where the take the oil from the Arabs (at that time the Ottomans) actually gelled. Clearly, it was oil and Germany and Russia were to be left out. This is true, but surely it does not take much of a level of critical thinking on the part of our university students in the West to spot that the lecturers are telling the students to accept contradictions. Eg the are told that anyone who wants to be part of the crowd (ie 95% of them) must support feminism and they must support islam – surely the students with hardly any ability to think critically can spot that they are expected by the current accepted culture to support opposites at the same time. It is like they are told to accept that the earth goes round the sun, and also the sun goes round the earth. Both are correct at the same time, they are told, and they respond with ‘okay, fine’. So we have to assume that the students must be fully aware that the message they are given (and accept) is totally flawed, and cannot stand up to any critical examination. The only conclusion is that most humans are wired simply to accept the dominant culture however ridiculous or contradictory it is, and however much it is actually harmful for their own society. And these same students who accept the contradictory must have zero self respect. Surely now and again they must look at themselves and say ‘I am a sheep, I accept what I am told even if it is clearly wrong’. They either experience this thought and in reply to themselves say ‘never mind’, or they never even care enough about truth and right to ever examine their own attitude. On a positive note, the culture they are told to accept is contrary to self interest, and they know it, therefore easy to swap for one that is opposite one day when the tide turns. They would be swapping a balloon twisted out of shape for one in a natural shape. It is not easy to sustain hatred against yourself (although for the left this is easy), and it is not easy to accept that you have to accept the destruction of your own race and culture, and its replacement with backward ones. Sadly, this is true. We are told ‘lions led by donkeys’ but actually the lions were quite keen to fight each other. The government could not force them all to fight if they did not want to. Same in WWII. Their group behaviour instincts were activated. And we chose for our military leaders those who could put aside empathy or compassion and accept losses and win. (Sociopaths?). So we selected this type to lead our men, they did not take over by a coup. In a ‘natural’ battle/war from a couple of hundred years before, fewer warriors died and then the losing side paid a penalty – they lost territory & paid ransoms. There was a lot of posturing and backing down and less fighting. Eg England and Wales faced each other off and after a week the Welsh just left. Even when the battle started they could end it when they wanted – and the men had some say in this as when they started to actually run away the commanders could not stop them. But then when war went to a big scale, the rules changed and neither side could pull out once committed. There was no mechanism to ‘get up and run away’ en masse even if they wanted to. But the Christmas truce was the closest they got.